Editor/Author Berry, Daina Ramey and Alford, Deleso A. 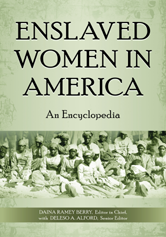 This singular reference provides an authoritative account of the daily lives of enslaved women in the United States, from colonial times to emancipation following the Civil War. Through essays, photos, and primary source documents, the female experience is explored, and women are depicted as central, rather than marginal, figures in history.